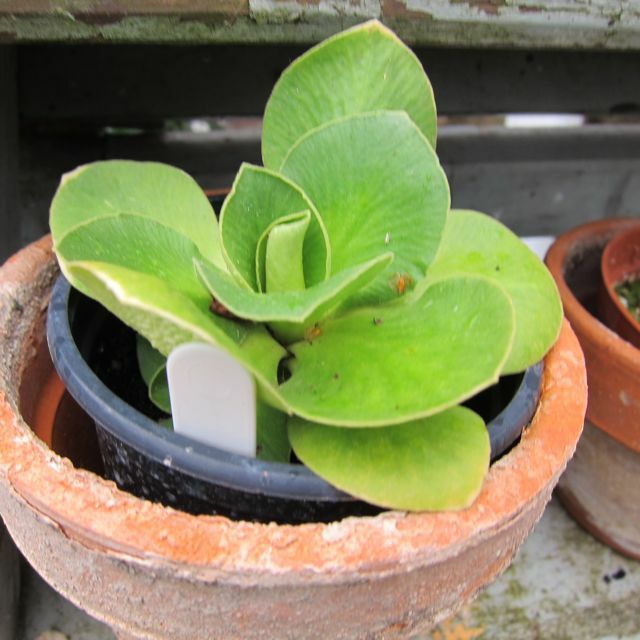 Hoe hoe grow: The Great Auricula swindle ...or...what AM I nurturing in the greenhouse ? The Great Auricula swindle ...or...what AM I nurturing in the greenhouse ? I have imposters in my greenhouse ... plants that are in there, being nurtured under false pretences ! Like cuckoos in the nest, they are not what they should be ! Now, I have come late to Auriculas, and it has taken me more than 50 years to appreciate them in all their stiff loveliness. 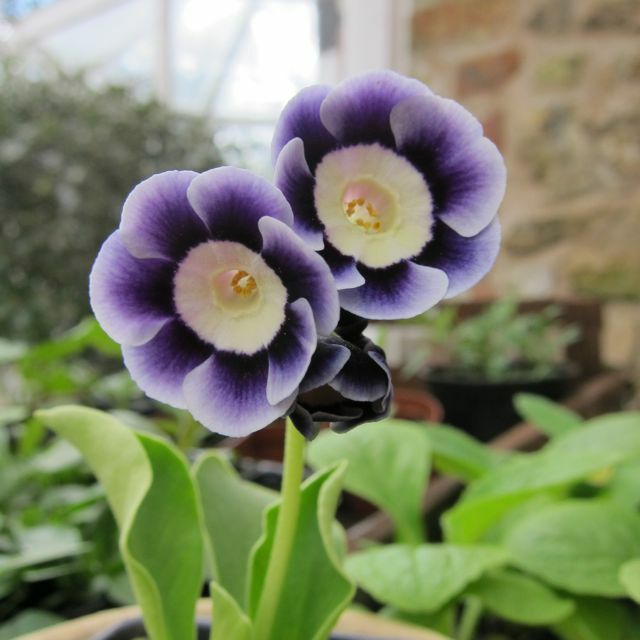 I first saw them on the stall of the National Auricula Society in Gateshead, in Spring of this year, and I fell in love, buying as many as I could carry. Within weeks, a couple of the babies I had bought began to bud and then to flower. I bought more... then, of course, had nowhere to display them, until my partner spotted an old pair of wide, wooden steps in a Reclamation Yard for £15. Did we paint them ? Nooo, shabby chic won the day, so we left them just as we found them. 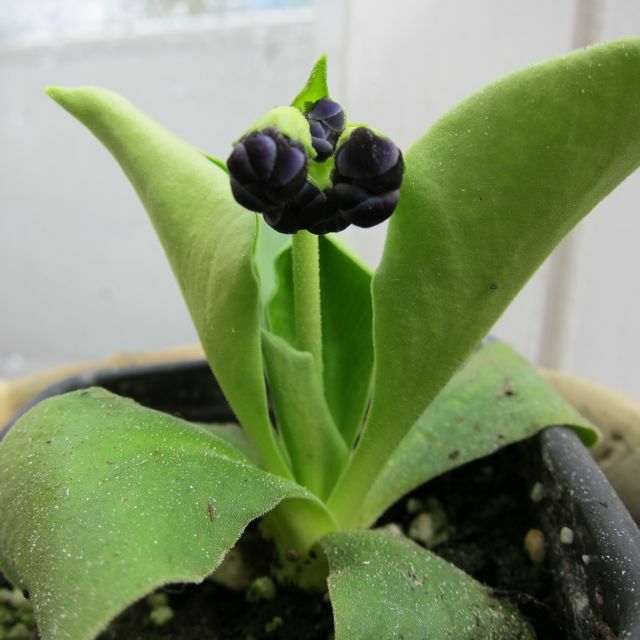 I like Auriculas and I also like bargains, so I started hunting for them online. There were lots of them, grown by loving enthusiasts and the plants were cheap enough, but the postage was RIDICULOUS ! Ever parsimonious, I decided to buy Auricula seed instead and bought a packet from a specialist amateur grower who showed his plants. Said seeds duly arrived from Ebay and I planted them according to the good, detailed instructions. I had expected slow growth for some reason, and quite demanding seedlings. I kept tending and feeding my growing cuckoos with nagging doubts. The plants I was growing did not resemble my mature Auriculas in any way ! Their leaves were quite fleshy and thick, not thin, long and dark green like my seedlings. The leaves were a different shape, colour, texture and growth pattern! Hmm! I told myself that the immature plants may look different, initially, to my mature Auriculas, but nothing changed as they grew larger. I am sure the seeds were sent in error, and that someone else is shaking their heads over a healthy crop of Auriculas they were not expecting. This seed swap was not intentional, and was due, I am sure, to good old human error. As I have made my own share of mistakes in the past (particularly where the garden is concerned!) so surely I can forgive and forget. But, how could it take me so long to realise the error ? And, more to the point ... what are they ?? Any ideas please ? I did wonder if they are Sweet Williams, but not too sure about that ! I have no idea what they are, though they look a bit like the carnations that are slow-motion growing in my garden. Never mind as long a they don't start walking towards the house you'll be fine. I don't know, but maybe it will be a fun surprise when they finally bloom! 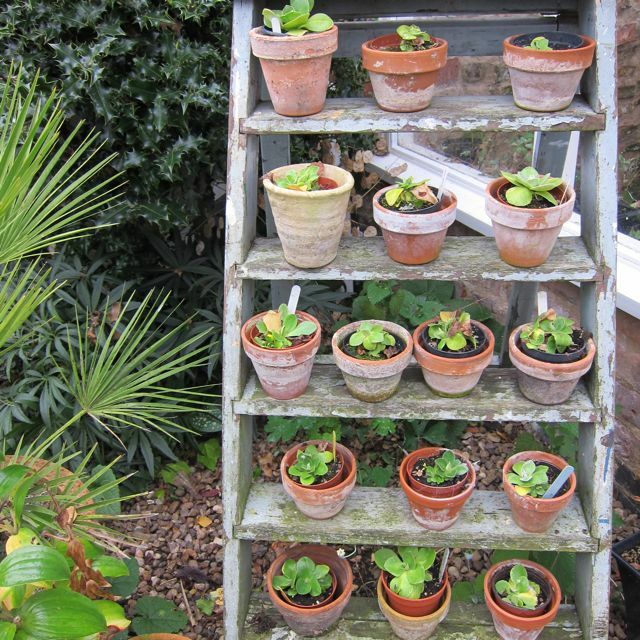 I do love your ladder of auriculas. Hi HolleyGarden, can't wait to find out !! The stepladder was WAY cheaper than an Auricula Theatre ! I love a guessing game. 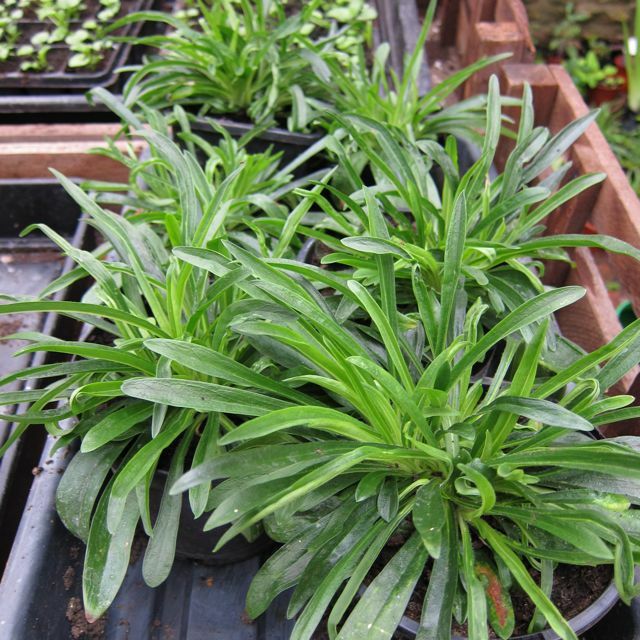 Are they wallflowers (Erysimum cheiri)... or bellflowers (Campanula)? Whatever they turn out to be, you have done an excellent job of propagating them and I really hope that Jane is wrong. 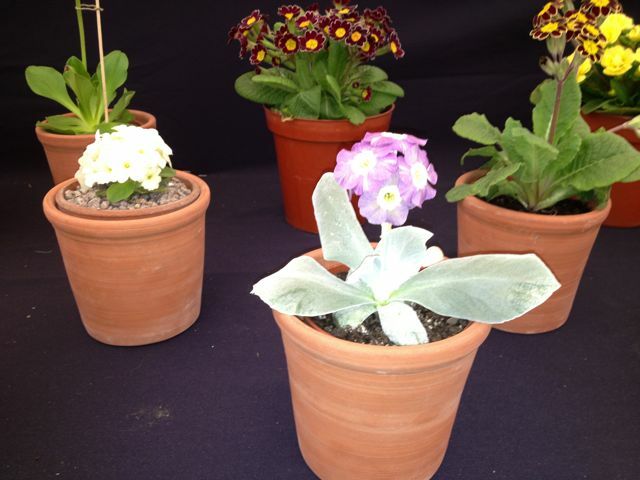 Beautiful auriculas - and a fab way of displaying them. Thanks, gardening shoe ! My partner guessed wallflowers too ! Guess I will have to wait until they flower ! Thank you for visiting my blog and leaving a comment. I love auriculas but I've never grown them myself. The wooden steps are a great way to display them. I'm guessing at wallflowers for your cuckoo in the nest. Thanks Jo ... wallflowers are winning at the mo ! 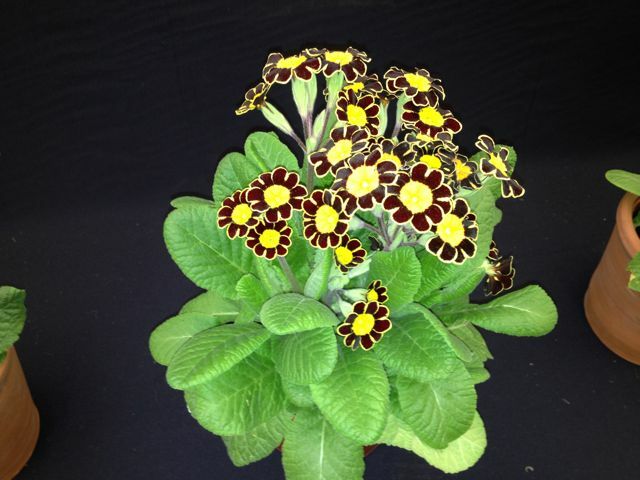 Gorgeous Auriculas - a shame you have cuckoo in the nest! How lovely Auricula 'Averil Hunter'! She is such a pretty girl, Stephanie ! !